Since I started using oDesk (as of 2016 oDesk is renamed Upwork), I haven't really been able to withdraw and use the money I earned. That is because in the Middle East, the use of Paypal is limited - can't use the money deposited in my Paypal account even though it's verified. 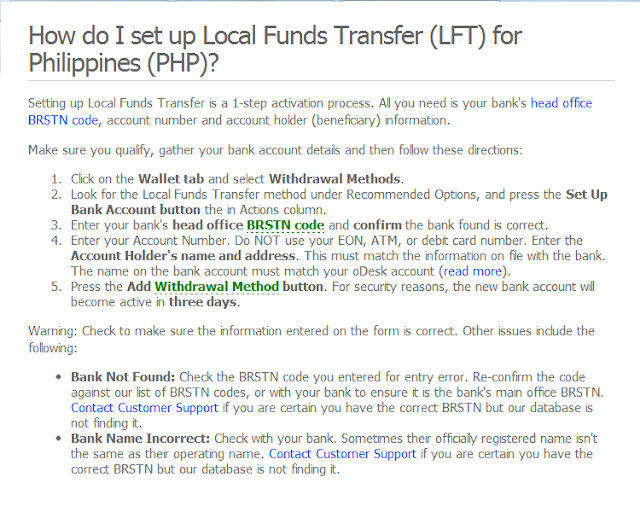 So, when I came back here in the Philippines, I am so glad to try out the Local Fund Transfer (LFT) method to withdraw my earnings. I chose this option though Paypal is commonly used here because I still can't use my Paypal here (haven't got it verified). Also, the withdrawal fee of $0.99 for the LFT method is waived for the first transaction. Click picture to see enlarged detailed steps. Setting up the account to withdraw via LFT is easy. Here are the simple steps necessary. Go to your Upwork account Wallet tab and select Withdrawal Methods. Look for the Local Funds Transfer method and press Set Up Bank Account button. Enter your bank's head office BRSTN code and confirm that the bank found is correct. Enter your account number, account holder's name and address. Press the Add Withdrawal Method button. If all goes well, your new bank account will be active in 3 days. If you would ask which bank is more advantageous to put your withdrawn earnings, Upwork recommends BPI and Unionbank because of banking relationships. It is stated in the Upwork help section that BPI will not charge you any fee when you remit your earnings there. But based on my use of this LFT to BPI, I was charged a fee of 10 pesos. Unionbank charges 50 pesos. Other bank charges are: BDO and Chinabank - 200 pesos; RCBC - 100 pesos; PNB - 250 pesos; Metrobank - 76.70 and Land bank - 50 pesos. These figures are the fees charged since December 2010. I am not sure if these fees have changed. 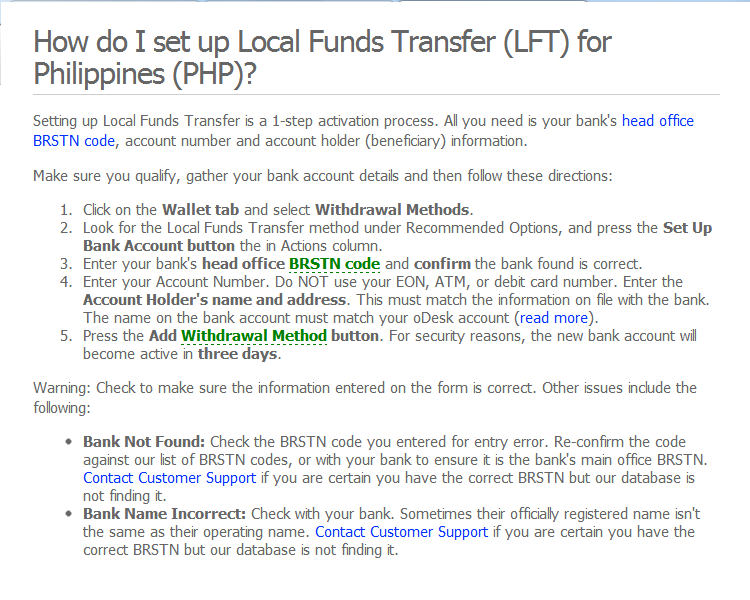 I'm using BPI to save on fees and I'm glad that I had a successful withdrawal using this option just recently. Thank You, Lord for the work at home opportunity and blessings. Thanks for this great tips. I will use this when I'll finally work at oDesk. Hay oDesk... I can't find any work at all... Ayaw nila sa akin, huhuhu! glad to hear that you're earning from oDesk. i created an account there before but can't find a job for me. LOL! nice tutorial/post too chin. regards! @Farida, it is a handful of work creating your profile on oDesk but it's necessary if you want to get some at home jobs. I'm blessed to have some jobs and good employers. I did have one employer that I regret working for. From then on, I became more careful in applying for jobs. @Sheryl, Hi, how's the baby? Earning from oDesk is really a blessing especially now that my husband doesn't have any work. It helps fill-in on our expenses. By the way, you're probably earning more from blogging so you can simply set aside finding jobs on oDesk. God bless. Same here. I can't get through with my application with Odesk. I was fortunate enough at a time when I had the chance to with a direct employer from Odesk and he paid good. Too bad his rates went down. I hope he comes back soon. How bout freelancer.com sis? Have u tried it? What's your say about them? @Mom Michelle, I have been successful in getting some projects in freelancer.com. I had to start at very low rates though. I'm blessed, I guess, because I had somehow received good feedback from employers there. I think I'm able to get more employers from freelancer.com but I have an employer at oDesk for 18 months (continuous) so I have a more regular income there. In 2008, I tried oDesk but I didn't get any invitation for an interview after applying for more than a month so I stopped. Last December 2011, I tried again and was very lucky to land a project after a week of trying. I did the LFT, too and it was easy! I used BDO but I cannot seem to remember how much I was charged for everything. I believe it was below 200. Thanks to LFT, I was able to transfer funds easily. Though, I do not agree for the extra cost since Odesk is already taking 10% of my hourly pay. There are other similar sites where I am working for like Staff.com which has local staffs so they can deposit my payment directly through my bank account so there's no additional cost.